If you would like to purchase any of the following items, please download this form, print it, complete and send to Sue Jones at the following address: 3 Moorlands Road, Wing, Leighton Buzzard, Beds. LU7 0RD, United Kingdom. We have a selection of Gambian wooden crafts, baskets, jewellery, cloth bags, etc…. so if anyone is interested in having an afternoon or evening presentation of film and photographs, along with (or without) a sale stall, then please contact Kate, Marje or Sue. 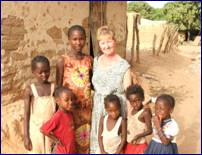 In April 2005, Gloz Keen (pictured below) made her first visit to The Gambia to see for herself the area in which this charity is centred and the work that is being done in the community. It is a truthful, enlightening and witty account of her experiences. Just £1.70 for this 30 page book – The publishing costs were donated, so all proceeds go to the charity. 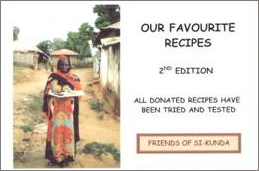 Our cookery book is now only £3.00!! All books are spiral bound and contain images of village life. The dictionary sponsoring scheme was a great success and we managed to supply enough for both Toniataba and Fonkoi Kunda schools, which is just fantastic! So would you now like to sponsor a pencil case? Each one holds pens, pencils, ruler and an eraser. We will make sure that it goes to a child in one of the schools that we support for just £2.00. We will put your name or whomever you nominate inside. All profits we make will go towards buying exercise books.